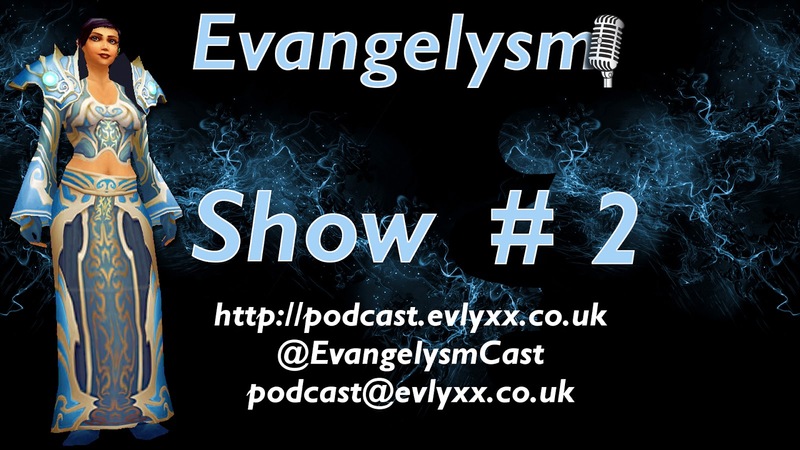 Evangelysm Podcast Show 2, Season 1. Show 2, Season 1, 11 February 2015. In the past week I have been mostly…. 3. Raiding Blackrock Foundry with the wonderful people of Exhumed, on Shadowsong EU but only 1 day cos of server issues. • In 6.1, Saving Grace one of the priests level 100 talents is being buffed by 50% and becoming an instant cast (currently 1.5 seconds). As this would be insanely strong in PVP it is then beig nerfed by 33% in PvP. My topic of the week was Twitter integration because in patch 6.1 Blizzard are giving us the ability to link a Twitter account to our WoW account and send “tweets” from inside the game, including attaching a screenshot. Now WoW isn’t breaking new ground with Twitter integration, far from it, Rift had this when it launched back in 2011 and I personally liked this feature in Rift for the short time I played it. The UI is unobtrusive and if you don’t use Twitter you’ll not be affected in anyway. If you are a Twitter user you probably Tweet about the game already and this feature is simply saving you the effort of grabbing your phone or alt-tabbing out to do that especially when it comes to attaching screenshots. omg my twitter account will start spamming my followers with every single achievement – I’m sure there will be the ability to choose what you tweet, if there isn’t simply unlink your Twitter account and tweet as you do now. I don’t want to see everyone else’s tweet spam. Well 2 things for this one why are you following someone if you don’t wanty to see their Tweets? If someone is Tweet spamming your feed simply un-follow them or let them know their spam is annoying, they may not realise it. Heck I know this one from personal experience, I played with adding a RSS feed from the armoury to my Twitter account and it spammed my followers with every epic I looted, every raid boss I killed and every achievement I obtained and that included stuff on alts, from all expansions and as someone that ran many fun runs with my guildmates through ICC, Ulduar and the like on a Saturday that was a lot of tweets and I got a lot of complaints all justified. I soon broke that link. we’ll soon see Blizzard offering promotions to “Tweet about #Warlords to win a free battlepet” or “Tweet your favorite character for 100 free garrison resources!” Even if it does happen it won’t be game breaking and only viewed as compulsory by haters. others are concerned that when we kill bosses and it will pop up “Want to share this with your friends?”. I’m 99.99% certain it won’t and even if it does if it annoys you that much again unlinking your Twitter account will disable the feature. there are also concerns over the api allowing addons to seize control of your Twitter account, if that happens don’t use the addon or once again, and I hate to say it again, simply don’t link your Twitter account. So for my money, its all good and there are simple steps to stop it being annoying. What are your views?